Clinicians and treatment providers working with addicted individuals often talk about addicts denying their condition at least part of the time. Although denial has often been conceptualised within a psycho-analytic framework as being a defense mechanism guarding against anxiety some research suggests two other interesting areas which may shed light on why actively using addicts and alcoholics do not appear to fully appreciate or minimize the extent of their addictive behaviour. The denial as defense mechanism argument does not account for the time when addicts do acknowledge that they have a problem with drugs or alcohol. In this blog we look at how a rationalising and justifying drug use schema seems to become habitually embedded in implicit memory and may even be part of a wider drug use schemata. First we will look at how addiction progresses via severity to a stimulus response conditioning whereby distress appears to activate automatic approach behaviours. In other words, distress recruits a procedural memory which automatically prompts drug use as a way to alleviate distress. Then we will show that this is stress based and that this stress recruits the memory system (implicit) of the dorsal striatum (DS). The interesting part in relation to this discussion is how one has to rationalise and justify the actions of this implicit memory system, post hoc or after responding, because it occurs automatically, without conscious deliberation, and one has to look back on this to explain it, so to speak. As addiction increasingly activates this brain region and memory system we suggest that the rationalising and justifying also becomes embedded in a schema which is automatically triggered by automatic behaviours to relieve distress. As it is embedded in a “addicted self” schema it is activated by distress. 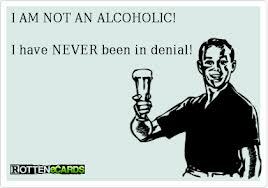 Thus addicts and alcoholics can rationalise and justify habitually without much conscious forethought. S-R habit reflects a shift from ventral to dorsal striatal control over drug seeking (1,5) – this is know as the brain region in charge of implicit or procedural memory. Procedural memory is the experiential basis of expectancies, with event schemata or scripts – basically what procedural memory has learnt what to expect to come next. In the case of addiction what to do in response to distress, namely drink. This may also the region hypothesised by Stephen Tiffany (6) to be involved in automatic drug use schemata (mentioned in other blogs). The region implicated in implicit or procedural memory is thus the dorsal striatum (DS) and in mediating stimulus-response (habit) learning, including that which occurs with chronic drug administration (7). Thus, the association that has been shown in various brain imaging studies, that between dorsal striatal dopaminergic activity and cue-induced craving could reflect the habit-based (automatized) nature of craving in addiction (6). The DS is recruited by both dopaminergic means and by stress. In laboratory animals, the dorsal regions of the striatum become progressively more engaged by cocaine as chronicity of cocaine use progresses (8,9). This may also reflect the stress mediated shift from VS to DS as a function of addictive severity. This has also be seen in humans. The DS is thus recruited in relation to addiction severity. As we have also seen this also appears to be linked to an increase in automatic intrusive thoughts about drugs and alcohol (10 ). Craving triggered by stress in cocaine abusers is also associated with activation of the DS as assessed with fMRI (11). This suggests that stress can, even in the absence of cues, activate the initiation of compulsive habit like response. Thus emotional distress can prompt this implicit memory bias over behaviour (12) . So as addiction becomes more severe emotional distress is more prevalent and prompts automatic responding. Cocaine patients also showed increased activity in the caudate and dorsal striatal regions during stress, activation that was significantly associated with stress-induced cocaine craving ratings. Increase in craving-related dorsal striatum/caudate activity combined with the decreased activity in anterior cingulate circuitry in cocaine patients suggests a neural response involving decreased emotional regulation and control and increases in habits/compulsions during stress. Thus stress may modulate instrumental action in favour of the dorsolateral striatum-based habit system and at the expense of the prefrontal cortex (PFC)-based goal-directed system. This stress (hormone)-induced switch to habit action may provide a mechanism by which acute stressors increase the risk of relapse, especially as drug users cite stress or negative mood as a major reason for relapse to drug use (13-15) and a meta-analysis identified high stress as an important predictor of relapse (16). After acute stress goal-directed control is disrupted and the habit system then takes over control and this stress-induced switch from goal-directed to habitual control of action involve the activation of the noradrenergic system (17,18). There is also evidence that other elevated stress chemicals, cortisol levels, in abstinent addicts may reduce explicit memory and executive functions that could be recruited to inhibit incorrect responses (19). It is these memory impairments—but not distress measures—predicted subsequent relapse (19). Steven Hyman (20) wrote that, “…addiction represents a pathological usurpation of the neural mechanisms of learning and memory that under normal circumstances serve to shape survival behaviors related to the pursuit of rewards and the cues that predict them”, (p. 1414). Addictive substances hijack the neural substrates of learning which would explain the ability of these substances to produce long-lasting and maladaptive behavioral and cellular changes that maintain addiction. The implicit bias of the DS thus appears to skew bias toward drugs and alcohol during emotional distress and is an automatic process. At a neural level, this is accompanied by abstinent addicts showing reduced activity in pre frontal areas but increased activity in the DS during stress-induced craving (11) which suggests opposite activation patterns in the neural structures that are associated with goal-directed and habit action, respectively. Activation in the caudate nucleus (pat of the DS) but not the activity in frontal regions (PFC) was associated with stress-induced craving. We believe that this leads to a compelling “got to have!” response in addicts. It is interesting, that in three of the major memory networks it is only the DS that requires a justification after behaviour to explain the compulsive, almost non-volitional nature of behavourial response. This may present itself in the justifying, rationalising, and so-called ‘denial’ often seen in addicts who are seeking to explain behaviour and this may have a motivational spring they cannot fully understand themselves. Thus we suggest it is activation of the DS and not just insight deficit (21,22) that can contribute to “denial” or the rationalising and justifying of obviously destructive behaviour – although this may play a part – that most comprehensively contributes to this self deception (because self deception is how it appears, the inability to weigh evidence against ongoing behaviour). Automatic behaviour elicits automatic response and these are promptly rationalised via rationalising drug use schemas. In this way, one of the effects of addictive drugs is to reinforce directly the behaviour that leads to their own self-administration, creating habits with powerful control over behaviour. Behaviours produced in this way in humans would occur without prior planning by the individual concerned and would therefore require the fabrication of a reason for their occurrence – they would require post hoc rationalising and justifying to explain these behaviours. Does this rationalising and justifying schema, that is so evident if addicts and alcoholics in justifying and rationalising their at times inexplicable behaviour, become ingrained in implicit memory as part of a greater automatised drug use schemata, which helps perpetuate addictive behaviours and further consolidate compulsive addictive behaviours? We know that heightened stress/emotional distress prompts use of implicit automatic memory over explicit, consciously retrieved memory. We also know that this means there is thus reduced knowledge of outcome in the addicted individual’s brain, as explicit memory is not being accessed, so addicts and alcoholics have limited knowledge of future negative consequences. So when these individuals are rationalising and justifying previous behaviour or future behaviour in fact, if may be because they are not accessing and considering the information stored in the hippocampus and prefrontal cortex. Or action outcome memory – the memory that informs you this behaviour normally leads to this outcome – so it seems they are deliberately not considering the affects of their actions. This is called a myopia for the future (24). Distress is not too interested in the future, just on the immediate, emotionally taxing here and now and in relieve distress. The information you are accessing when discussing why addicted individuals do the things they do (via the action outcome parts of your brain, such as the PFC and hippocampus) and wondering, dismaying, why they cannot not do the same thing, is not the same regions dedicated their responses and actions. Distress has “offlined” their PFC (25) and recruited automatic parts of the brain, “fight or flight” parts of the brain, noradrenaline fuelled parts of the brain. The brain is on emergency mode or survival mode. The addict or alcoholics is more inclined to listen to this part of his own brain in ensuring “survival”. Rather than aggressively challenging it, or insisting on sometimes stating the obvious about certain facts, the actively using addict or alcoholic may be more inclined to listen to alternative survival strategies instead. This is partly the reason AA works. The recovering alcoholic can reassure the actively using alcoholic that he knows what he is going through and this empathy or relating can help them consider, via thePFC, alternatives to “surviving” such as recovery via 12 step or other groups or treatment. He embodies a living truth, an undeniable reality, that he or she has “survived” thus far via alternative means. They have found an alternative solution to their underlying emotional distress. Hence begins a reduction in the emotional distress that fuels automatic compulsive behaviours and the slow, gradual recruitment of the PFC and the use of action -outcome thinking. Time improves these neural mechanism and will eventually aid recovery. As one AA said to me “Don’t preach, tell or give orders. Show how to recover.” This reduces distress, fight or flight reactions and models more constructive “survival” behaviour. 1. Cardinal, R. N., Pennicott, D. R., Lakmali, C., Robbins, T. W., & Everitt, B. J. (2001). Impulsive choice induced in rats by lesions of the nucleus accumbens core. Science, 292(5526), 2499-2501. 2. Everitt, B. J., & Robbins, T. W. (2005). Neural systems of reinforcement for drug addiction: from actions to habits to compulsion. Nature neuroscience, 8(11), 1481-1489. 3. Volkow, N. D., Wang, G. J., Telang, F., Fowler, J. S., Logan, J., Childress, A. R., … & Wong, C. (2006). Cocaine cues and dopamine in dorsal striatum: mechanism of craving in cocaine addiction. The Journal of neuroscience,26(24), 6583-6588. 4. Redish, A. D. (2004). Addiction as a computational process gone awry.Science, 306(5703), 1944-1947. 5. Vanderschuren, L. J., Di Ciano, P., & Everitt, B. J. (2005). Involvement of the dorsal striatum in cue-controlled cocaine seeking. The Journal of neuroscience,25(38), 8665-8670. 7. White, N. M., & McDonald, R. J. (2002). Multiple parallel memory systems in the brain of the rat. Neurobiology of learning and memory, 77(2), 125-184. 8. Letchworth, S. R., Nader, M. A., Smith, H. R., Friedman, D. P., & Porrino, L. J. (2001). Progression of changes in dopamine transporter binding site density as a result of cocaine self-administration in rhesus monkeys. The Journal of Neuroscience, 21(8), 2799-2807. 9. Howlett, A. C., Breivogel, C. S., Childers, S. R., Deadwyler, S. A., Hampson, R. E., & Porrino, L. J. (2004). Cannabinoid physiology and pharmacology: 30 years of progress. Neuropharmacology, 47, 345-358. 10. Kranzler, H. R., Mulgrew, C. L., Modesto‐Lowe, V., & Burleson, J. A. (1999). Validity of the Obsessive Compulsive Drinking Scale (OCDS): does craving predict drinking behavior?. Alcoholism: Clinical and Experimental Research,23(1), 108-114. 11. Sinha, R., Lacadie, C., Skudlarski, P., Fulbright, R. K., Rounsaville, B. J., Kosten, T. R., & Wexler, B. E. (2005). Neural activity associated with stress-induced cocaine craving: a functional magnetic resonance imaging study.Psychopharmacology, 183(2), 171-180. 13. Brandon, T. H. (1994). Negative affect as motivation to smoke. Current Directions in Psychological Science, 33-37. 14. Rounsaville, B. J., Kosten, T. R., Weissman, M. M., & Kleber, H. D. (1986). Prognostic significance of psychopathology in treated opiate addicts: a 2.5-year follow-up study. Archives of General Psychiatry, 43(8), 739. 15. McKay, J. R., Rutherford, M. J., Alterman, A. I., Cacciola, J. S., & Kaplan, M. R. (1995). An examination of the cocaine relapse process. Drug and Alcohol Dependence, 38(1), 35-43. 17. Schwabe, L., Tegenthoff, M., Höffken, O., & Wolf, O. T. (2010). Concurrent glucocorticoid and noradrenergic activity shifts instrumental behavior from goal-directed to habitual control. The Journal of Neuroscience, 30(24), 8190-8196. 18. Shalev, U., Highfield, D., Yap, J., & Shaham, Y. (2000). Stress and relapse to drug seeking in rats: studies on the generality of the effect.Psychopharmacology, 150(3), 337-346. 19. Fox, H. C., Jackson, E. D., & Sinha, R. (2009). Elevated cortisol and learning and memory deficits in cocaine dependent individuals: relationship to relapse outcomes. Psychoneuroendocrinology, 34(8), 1198-1207. 20. Hyman, S. E. (2005). Addiction: a disease of learning and memory. American Journal of Psychiatry, 162(8), 1414-1422. 21. Goldstein, R. Z., Craig, A. D., Bechara, A., Garavan, H., Childress, A. R., Paulus, M. P., & Volkow, N. D. (2009). The neurocircuitry of impaired insight in drug addiction. Trends in cognitive sciences, 13(9), 372-380. 22. Moeller, S. J., Maloney, T., Parvaz, M. A., Alia-Klein, N., Woicik, P. A., Telang, F., … & Goldstein, R. Z. (2010). Impaired insight in cocaine addiction: laboratory evidence and effects on cocaine-seeking behaviour. Brain, 133(5), 1484-1493. 23. Tice, D. M., Bratslavsky, E., & Baumeister, R. F. (2001). Emotional distress regulation takes precedence over impulse control: if you feel bad, do it!. Journal of personality and social psychology, 80(1), 53. 24. Bechara, A., Dolan, S., & Hindes, A. (2002). Decision-making and addiction (part II): myopia for the future or hypersensitivity to reward?. Neuropsychologia,40(10), 1690-1705. 25. Arnsten, A. F. (2011). Catecholamine influences on dorsolateral prefrontal cortical networks. Biological psychiatry, 69(12), e89-e99.